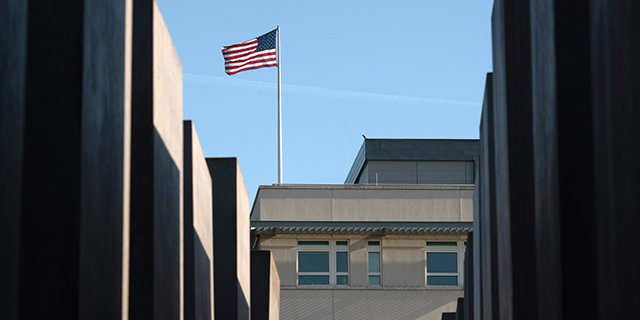 The ongoing shutdown of large parts of the federal government – now at 18 days and counting – has left hundreds of thousands of federal workers either furloughed or working without pay indefinitely, reduced staffing at national parks to skeleton levels, and closed down popular museums. 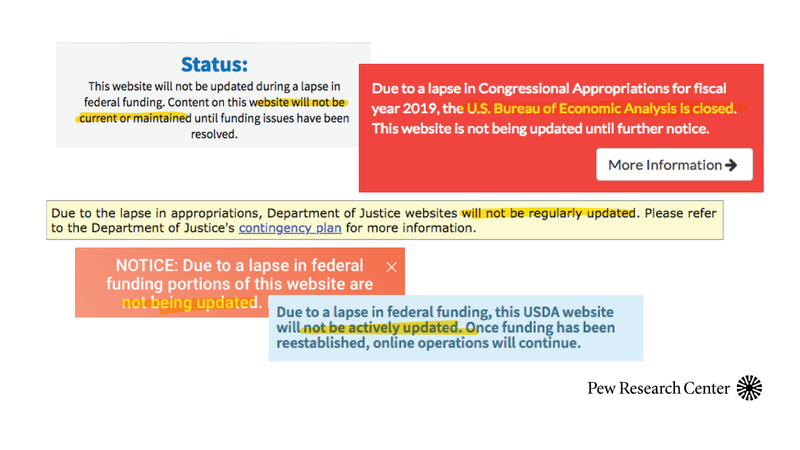 It’s also squeezed the daily flood of data from federal agencies down to a trickle, affecting everyone from investors and farmers to researchers and journalists. The share of Americans who use ride-hailing services has increased dramatically. 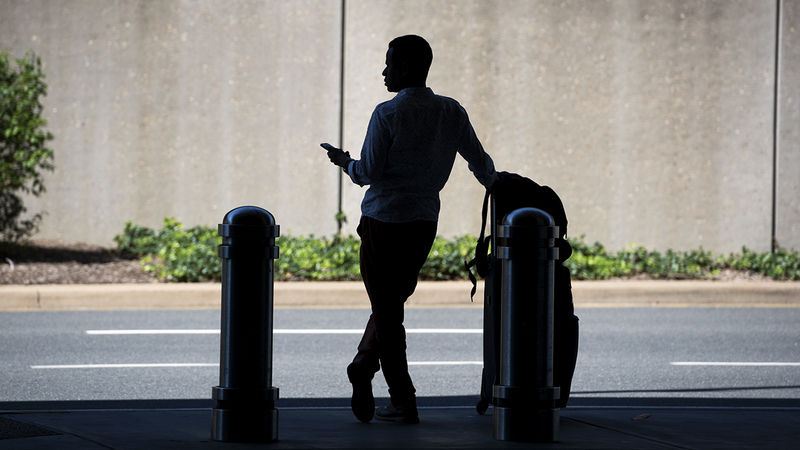 Today, 36% of U.S. adults say they have ever used a ride-hailing service such as Uber or Lyft, according to a Pew Research Center survey conducted in fall 2018. By comparison, just 15% of Americans said they had used these services in late 2015, and one-third had never heard of ride-hailing before. Ride-hailing use has increased across most demographic groups, but adoption figures continue to vary by age, educational attainment and income level. 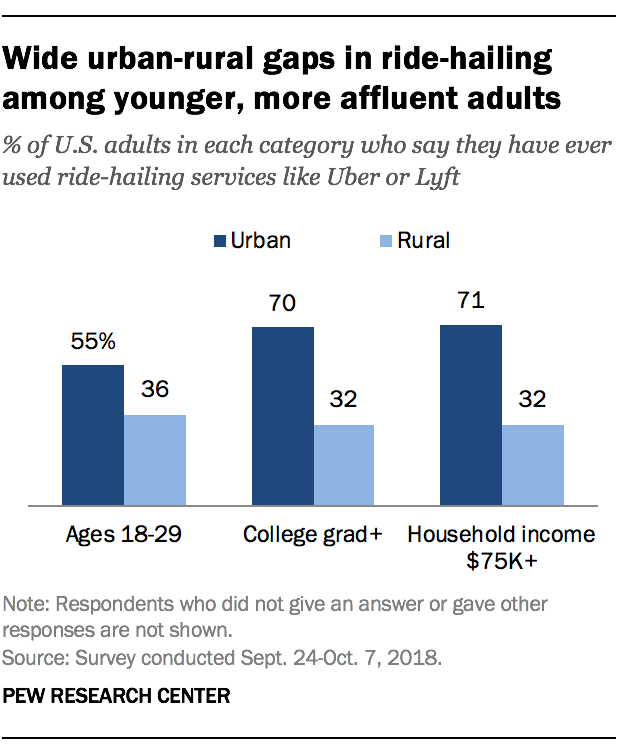 For example, roughly half of Americans ages 18 to 29 (51%) say they have used a ride-hailing service, compared with 24% of those ages 50 and older. Those whose annual household income is $75,000 or more are roughly twice as likely as those earning less than $30,000 to have used these services (53% vs. 24%). And over half of adults with a bachelor’s or advanced degree (55%) say they have used these services, compared with 20% of those who have a high school diploma or less. Notably, adoption gaps between urban and rural Americans are present even within groups that collectively use ride-hailing services at high rates. 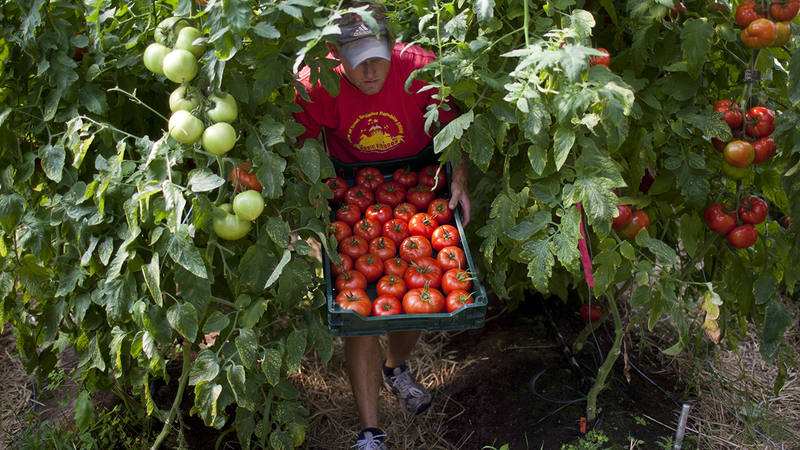 For example, among Americans who earn $75,000 or more annually, urban residents are more than twice as likely to have used these services as high-income individuals living in rural communities (71% vs. 32%). Substantial urban-rural differences also exist among Americans with a college degree and among those ages 18 to 29. These differences could be related to the fact that ride-hailing services are less widespread in rural areas. This survey did not specifically ask if people knew whether ride-hailing services were available in their community, but a separate Center survey conducted earlier this year found that rural residents were significantly more likely than those living in other areas to say access to public transportation is a major problem where they live. Ride-hailing companies have made efforts to expand their services to rural and remote areas. But lower population density, long travel distance and relatively low incentives for drivers are often cited as potential hurdles. Donald Trump made fighting crime a central focus of his campaign for president, and he cited it again during his January 2017 inaugural address. His administration has since taken steps intended to address crime in American communities, such as instructing federal prosecutors to pursue the strongest possible charges against criminal suspects. 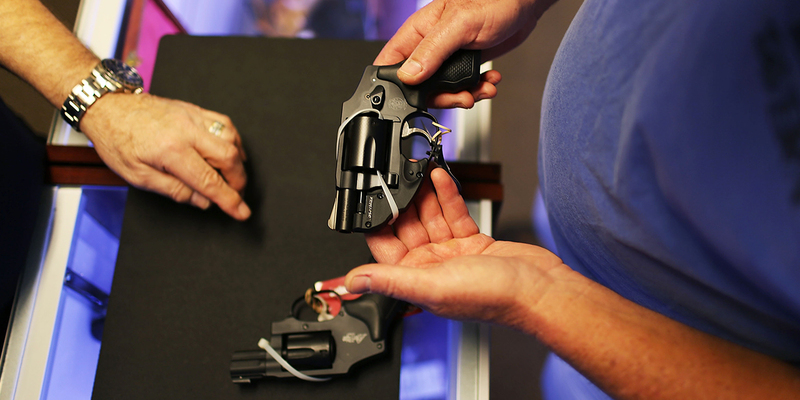 Here are five facts about crime in the United States. 1Violent crime in the U.S. has fallen sharply over the past quarter century. 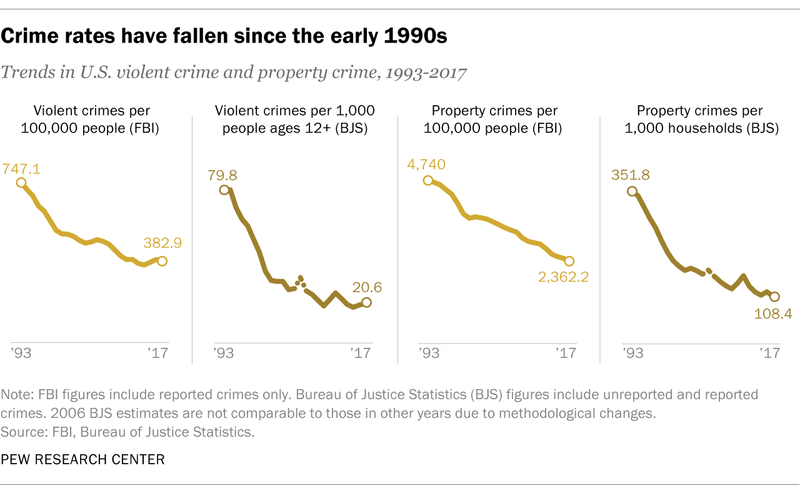 The two most commonly cited sources of crime statistics in the U.S. both show a substantial decline in the violent crime rate since it peaked in the early 1990s. One is an annual report by the FBI of serious crimes reported to police in approximately 18,000 jurisdictions around the country. The other is an annual survey of more than 90,000 households conducted by the Bureau of Justice Statistics, which asks Americans ages 12 and older whether they were victims of crime, regardless of whether they reported those crimes to the police. Using the FBI numbers, the violent crime rate fell 49% between 1993 and 2017. Using the BJS data, the rate fell 74% during that span. (For both studies, 2017 is the most recent full year of data.) The long-term decline in violent crime hasn’t been uninterrupted, though. The FBI, for instance, reported increases in the violent crime rate between 2004 and 2006 and again between 2014 and 2016. The new Congress is slightly more religiously diverse than its predecessor, but it remains overwhelmingly Christian, according to a new Pew Research Center analysis of congressional data collected by CQ Roll Call. 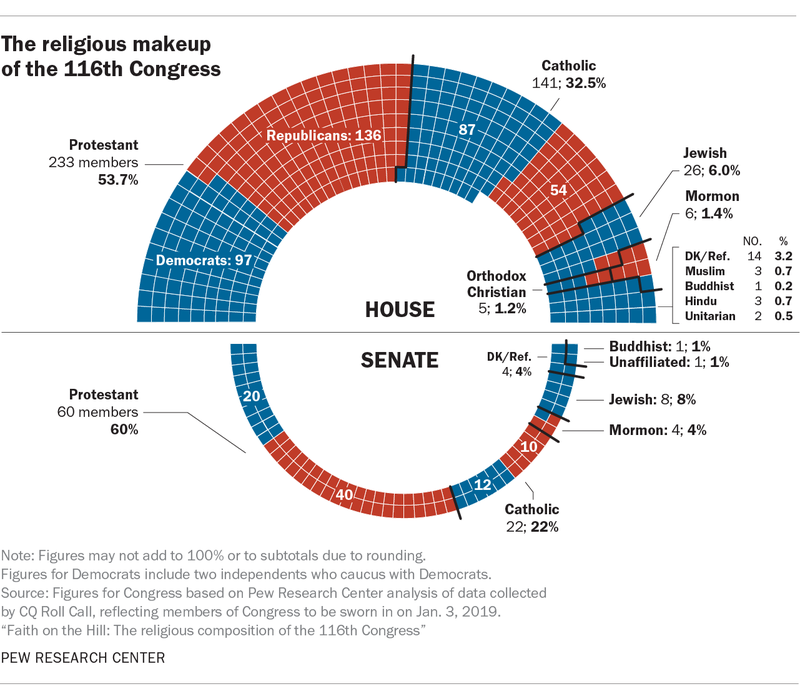 1The religious composition of the new Congress is very different from that of the U.S. adult population. While the number of self-identified Christians in Congress has ticked down slightly, Christians as a whole – and especially Protestants and Catholics – are still overrepresented in proportion to their share in the general public. But by far, the largest difference between the U.S. public and Congress is in the share of people who are unaffiliated with a religious group. In the general public, 23% say they are atheist, agnostic or “nothing in particular.” In Congress, just one person says she is religiously unaffiliated – Sen. Kyrsten Sinema, D-Ariz., who was recently elected to the Senate after three terms in the House. On Jan. 1, 1993, Czechoslovakia peacefully split into the Czech Republic and Slovakia, an event sometimes called the “Velvet Divorce.” But despite having been one nation for roughly 75 years, the two countries have very different religious profiles, according to a recent Pew Research Center study. 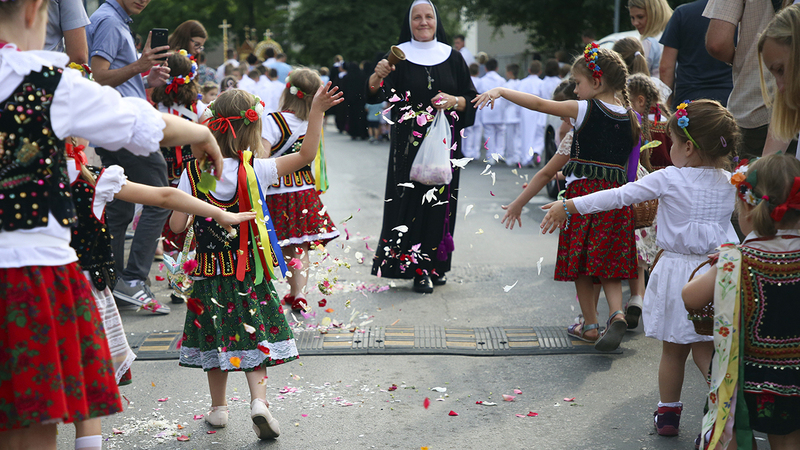 While Slovakia is majority Catholic (63%), around seven-in-ten Czechs (72%) are religiously unaffiliated – the highest share of unaffiliated adults in 34 European countries surveyed by the Center. In addition, far more people in Slovakia than in the Czech Republic say they believe in God (69% and 29%, respectively). A record 102 women will serve in the incoming House of Representatives, comprising 23.4% of the chamber’s voting members. More than a third of those women (35) won their seats for the first time in last month’s midterms. (In addition, four of six nonvoting House members, who represent the District of Columbia and U.S. territories, are women.) And Minority Leader Nancy Pelosi is poised to reclaim the House speaker’s gavel she last held from 2007 to 2011. The midterms also sent five new women to the Senate, more than making up for the two female senators who lost their re-election bids. And Arizona Republican Martha McSally, who lost a close Senate race to Democrat Kyrsten Sinema, got there anyway: She was appointed to fill the seat of Sen. Jon Kyl, who is retiring at the end of the year. All told, 25 women will be serving in the new Senate. 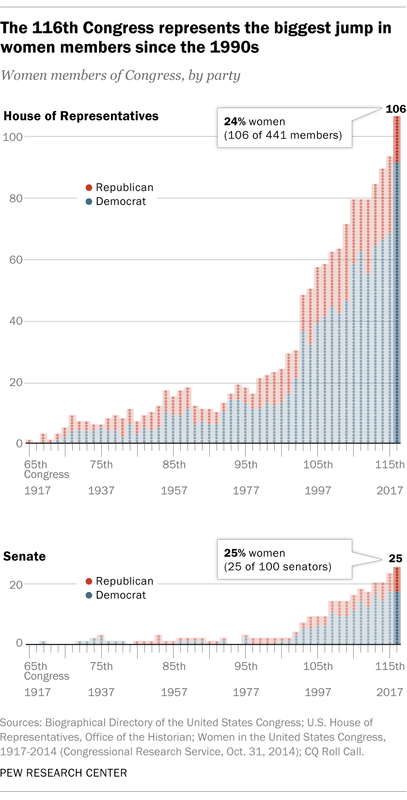 Women have been in Congress for more than a century. The first, Republican Jeannette Rankin of Montana, was elected to the House in 1916, two years after her state gave women the vote. But it’s only been in the past few decades that women have served in substantial numbers. 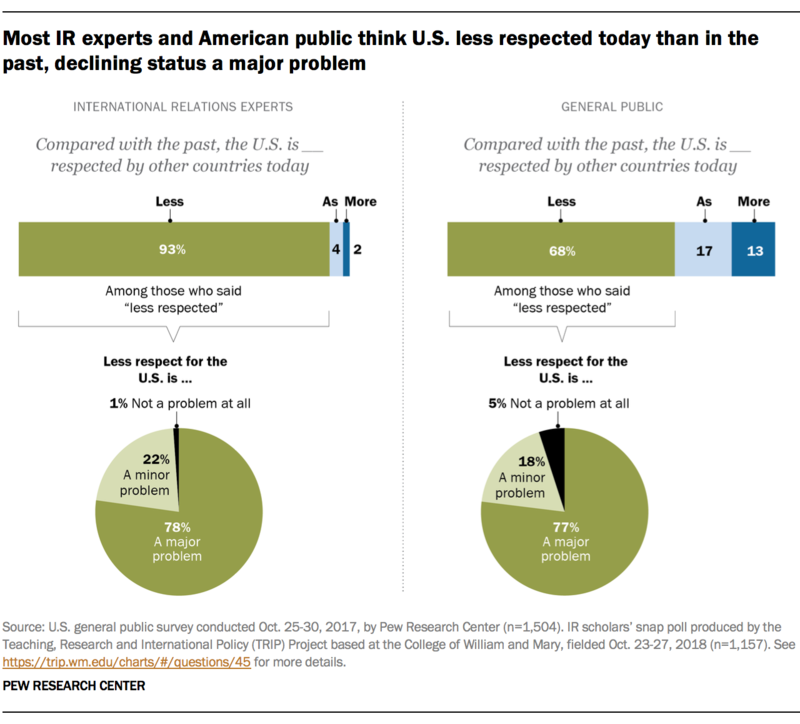 Nearly two-thirds (63%) of the 325 women elected to the House since Rankin’s time (including the incoming new members) have been elected since 1992, and nearly half (48%) since 1998.
International relations experts at American colleges and universities overwhelmingly say the United States is less respected by other countries today than it was in the past – and the U.S. public agrees with this assessment, though to a lesser extent.